Showcase your expertise, convert leads into customers. Savvy marketers know that content marketing is the key to an effective digital strategy. So what exactly is content marketing? By creating content that showcases your industry knowledge and expertise, you gain influence over your audience and earn their trust. Trust is the secret sauce that converts leads into customers. Gone are the “Always Be Closing” days of Glengarry Glen Ross. With a solid content marketing strategy, your marketing efforts take advantage of the social reciprocity. It’s intuitive. People help those who have helped them. When you provide useful and transparent information to your potential customers, they are more likely to complete a purchase decision. 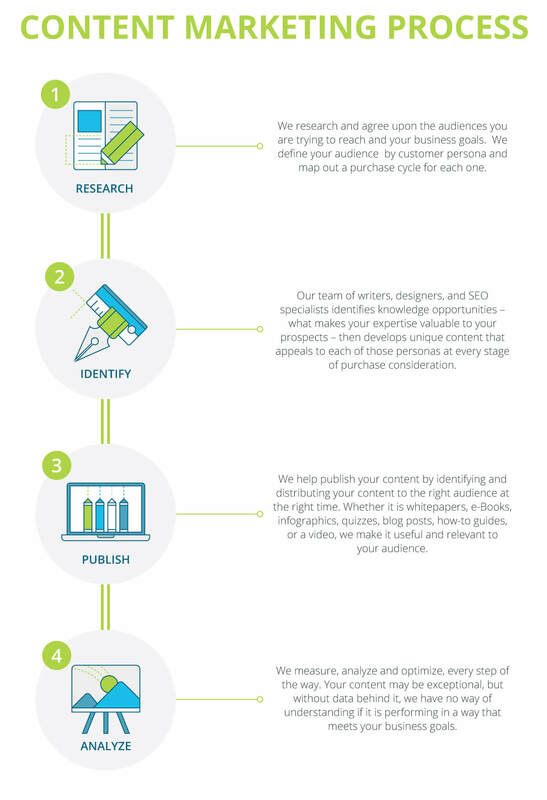 There are more moving parts to this simplified graphic, but it helps visualize how content marketing works. 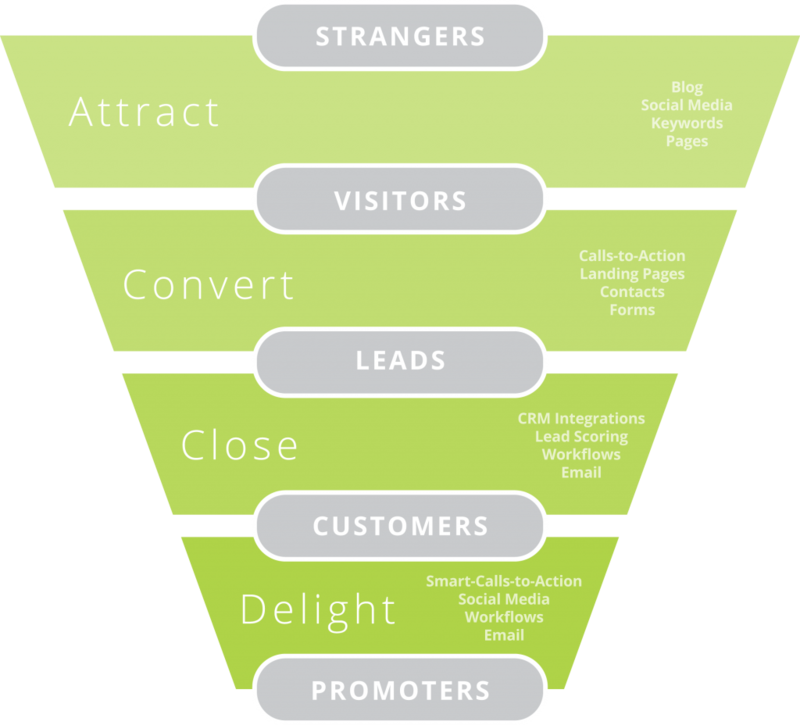 At the top of the funnel are people exploring the possibility of purchase. They may show some interest in your product or service via a website visit, or click on a display ad, but they are not ready to buy. People in the middle of the funnel are deeper into purchase consideration. They’re still not ready to purchase. People at the bottom of the funnel are ready to buy. Given that these three groups are in different stages of the purchase process, each customer group requires a separate and distinct content message. Ever shopped for a new car or perhaps a dishwasher? It’s likely your first action was casual research online. Were you ready to have a sales person call you from an auto dealership after one web page visit? Probably not. You wouldn’t ask someone to get married after one date either. What you may have been ready for was additional insight about the car you were considering, or an insider’s guide to dishwashers—perhaps an article from Consumer Reports or an educational video. Content marketing is a key component of an overall inbound marketing strategy* we develop with clients. This all starts with customer research, customer personas and business goals. Why is content marketing fuel for SEO? Exceptional content fuels traffic to your website. Think of it as a booster rocket for your SEO efforts. Every time you create a content offer, it is an opportunity to optimize a landing page on your site for new keywords. Over time, your site will increase in organic search results for new terms. Tip: if you create great content, other websites will start linking to your content. Inbound links are Google’s #1 factor for search rankings, so this boosts your potential to rank for organic search as well. Genius! READY TO CREATE EXCEPTIONAL CONTENT?